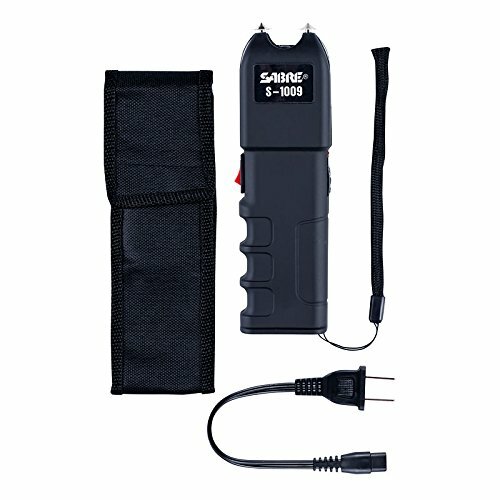 Sabre Tactical Stun Gun—Anti-Grab Technology (Shocks Person If They Try to Take)–Emits Intimidating 95 dB—120 Lumen Flashlight, Wrist Strap & Holster by Sabre at SFCPA. MPN: S-1009. Hurry! Limited time offer. Offer valid only while supplies last. With a 1.250 µC charge, this SABRE stun gun is extremely strong, producing ‘intolerable pain’ according to the National Institute of Justice. With a 1.250 µC charge, this SABRE stun gun is extremely strong, producing ‘intolerable pain’ according to the National Institute of Justice. Empower yourself with extreme stopping power when you need it most. The Anti-Grab Bar Technology shocks attacker if they attempt to take the gun from you; contoured grip aids hand alignment making it easy to use and control. You’ll also benefit from a built-in 120-lumen LED flashlight featuring high, low and strobe settings which may help you disorient from a distance, possibly allowing you to escape to safety before needing to use the stun feature. And an intimidating 95 db sound—as loud as a subway train—attracts attention, alerting people nearby. You've seen plenty of extremely high voltage claims - possibly up to 100 million volts. These astronomical figures sound impressive, but in truth, when it comes to stun guns, these claims are wildly misleading AND physically impossible. Unfortunately, there’s no government regulation in the stun gun industry, leaving consumers vulnerable to products that aren’t as strong as they claim. GET THE FACTS – WATCH THE VIDEO! Charge, measured in microCoulombs (µC), indicates stun gun strength according to the NIJ—not volts. Family owned and operated for more than four decades, the Security Equipment Corporation is the #1 brand trusted by police and consumers worldwide for pepper spray and is an industry leadership in developing safety programs for the end user. If you have any questions about this product by Sabre, contact us by completing and submitting the form below. If you are looking for a specif part number, please include it with your message.